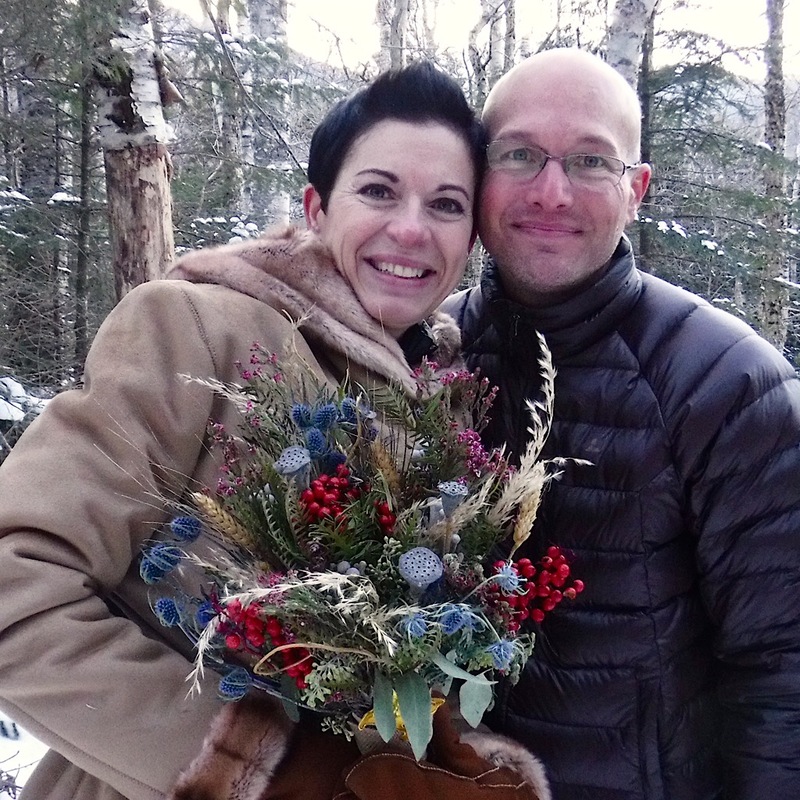 We just posted about a wedding we officiated at Glen Ellis Falls. And as was mentioned, it wasn’t the only wedding of the day. 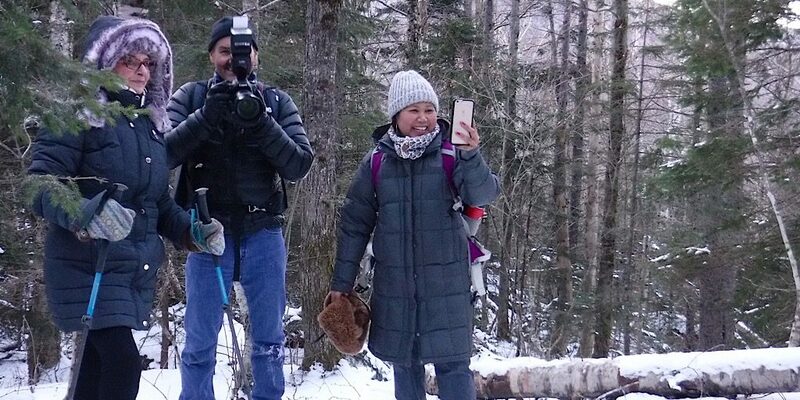 After a morning at the falls, our Justice of the Peace, Mike Cherim, set out for Crawford Notch and an iconic and aptly-named rock called Elephant Head. 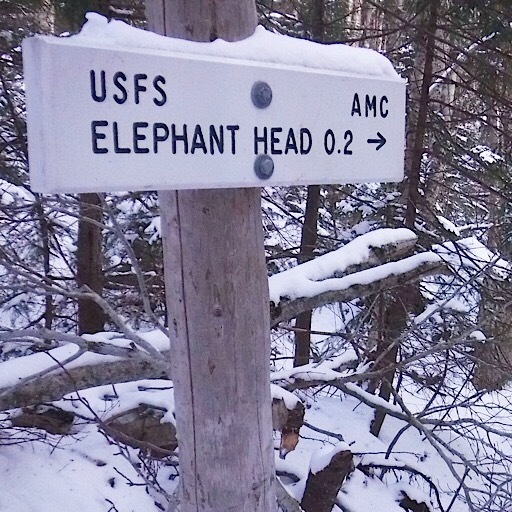 For those who don’t know, Elephant Head is a 150-foot high rock formation located at the Gateway of Crawford Notch, down the road a piece from the AMC’s Highland Center. It notably keeps an eye open to all who approach from the north. Seeing this one-eyed pachydermesque rock as you approach one quickly realizes how it got its name. It does indeed look like the head of an elephant. The top of the head is a lovely spot to hike to offering fantastic 180° views to the west. It even offers exciting rock climbs (The Trunk and variations), and ice climbs (Elephant Head Gully, located behind the left ear, so to speak). The trail is not super easy with its jumbled rocks, rotting bog bridges, and muddy bits, but it is still accessible; and close at only three-tenths of a mile in. 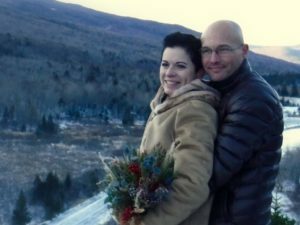 The bride and groom, Lauren and Dan, are strong hikers and could have opted for anywhere they wanted within the White Mountain National Forest, but Elephant Head was already special to them for personal reasons. Moreover, for one special friend they made sure it was super easy. Not everyone hikes, it seems. This revelation is shocking, no? 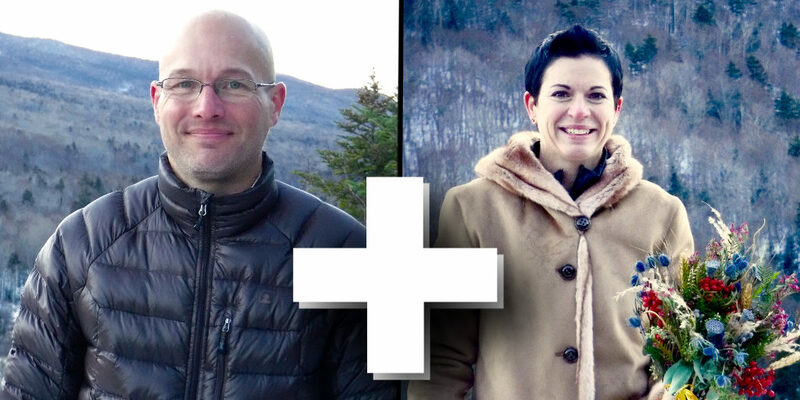 Mike, Lauren, and Dan initially met at The Met Coffee House in the North Conway Village. We always suggest a pre-meet. Instantly everyone hit it off and they wanted Mike as their officiant. They knew of him from the hiking community so they connected there, plus they connected in person. They also knew they wanted a very small, intimate ceremony with a tiny contingent of friends and family. They wanted Mike to dress as he would as a hiker up there atop Elephant Head in the cold, including wearing his trademark Buff. They also requested he join them afterward at the Highland Center for their reception. This really made it special; love was in the air, friendships in the making. Libations and much laughter ensued for an unforgettable evening. And the Highland Center really helped make it nice, even gifting the couple a family membership. One plus one… this is one special couple. Lauren and Dan’s close friend Adam, who coincidentally happened to be taking a Wilderness First Aid (WFA) course with us over at SOLO this weekend, mentioned days ago that we were tying the knot for a couple of close friends of his. He wondered where the ceremony might be held. We later learned it was a closely guarded secret. As it turned out, Saturday morning, while addressing our WFA group, before all the weddings started happening, we mentioned our agenda for the day. We slipped. Once we said wedding at Elephant Head Adam shouted, “I knew it!” The class laughed. 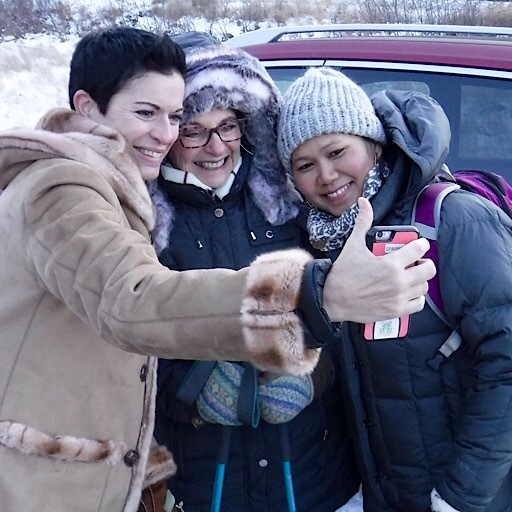 Selfies: This is such a fun today thing. Lauren dragged a 4-inch train of ice along that had formed on her dress. 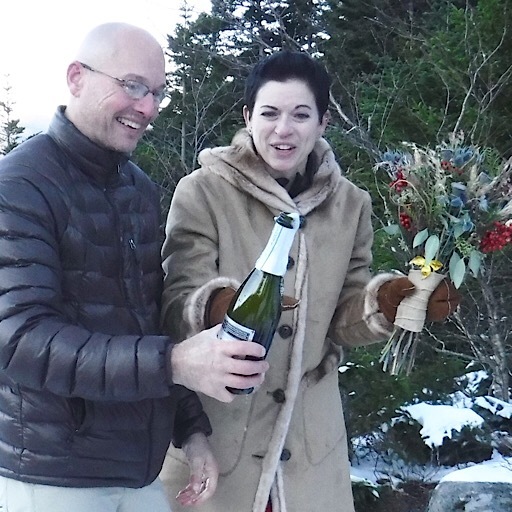 Lauren and Dan braved the cold as did we all during their emotionally-charged wedding. But while the frozen ground crunched under our feet, the Arctic breeezes blew, and the fir boughs gave up their dusting of snow at the slightest bump we shivered less and smiled more and more as the ceremony continued. All around us the beauty of nature warmed our hearts while the energy of happiness for Lauren and Dan’s union fueled us. It was freezing yet it barely felt cold, if that makes sense. To hikers this is perfectly normal. Hold my champagne and watch this. These guys were so cool to be with, yet they brought so much warmth. Probably from all the laughter. The highjinx continued culminating in a bit of a champagne shower. The smiles radiated outward. After more photos we retreated to the Highland Center to further celebrate and share some quality time together as a group. Thank you. Everyone ended up wearing champagne. Congratulations Lauren and Dan. May your love for each other blossom beyond forever and always!